Home / Artifacts / 16MM VINTAGE MOVIE PROJECTOR CIRCA 1940. RARE SCULPTURE PIECE FOR MEDIA ROOM DISPLAY. 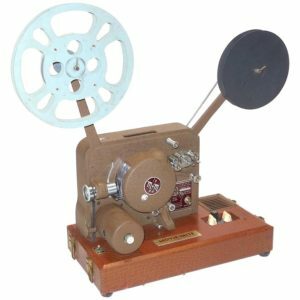 For your consideration is this Bell and Howell 16mm Motion Picture film projector designed in 1940 and built in 1945. Immaculate condition and the perfect example of 16mm movie projection for the 1940s. All original and conserved with original paint and finishes. Made in USA. 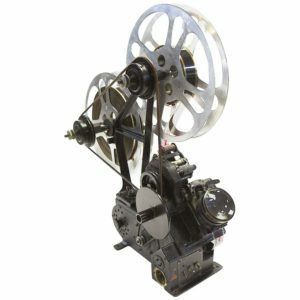 Bell and Howell was a leading USA pioneer of motion picture ~Cinema Machinery~ going back to the early days of silent 35mm Motion Picture Production. 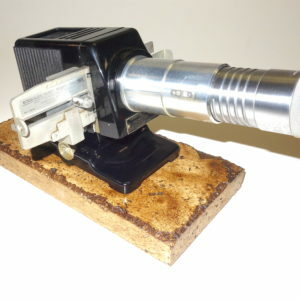 Charlie Chaplin owned a Bell and Howell 35mm camera and used it to shoot his early silent films. Gorgeous look for a display in your home, office, screening room, media room or museum collection. 100% correct and accurate in all ways. A rare unmolested find. A true vintage Motion Picture artifact.